« Mark Bale says Welcome! I AM LAZY – PROMISE THAT I WILL BE BETTER SOON! New Remix out! Sorry that this is looking so empty here! I will take care of this asap! I am very happy, that our Remix for Andy Caldwell has been released on Beatport the 12th of May. 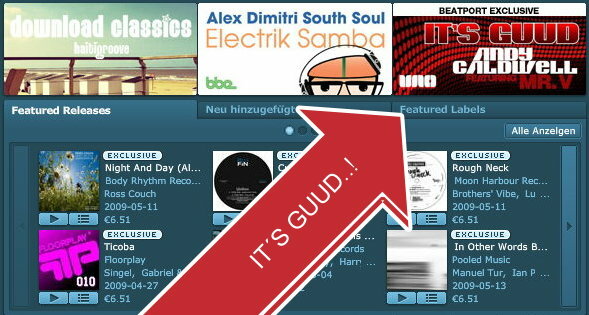 The Tune is called It´s Guud and features the great Mr. V! Remixes are from Matteo DiMarr & Tim Weeks!!! Yeeeeeeeeesssssssssss… What a great Package! Would be very helpful if you could support us! With spins from House music’s heavy weights Bob Sinclar, Erick Morrillo, Hector Romero, Sarah Main and more, Andy Caldwell’s latest release continues to garner a stellar response from the clubs and dj’s alike. Featuring the vocal talents of Mr. V and remixes from Matteo Dimar, Tim Weeks and Bale & Voltaire, this one is GUUUUD!!! This entry was posted on May 14, 2009 at 4:15 pm and is filed under Uncategorized. You can follow any responses to this entry through the RSS 2.0 feed. You can leave a response, or trackback from your own site.